Anyone know if a C3 fuel tank will fit in a C2? I have a customer with a '66 Vert that needs a tank, and I have a good tank that Im not using from my '69 coupe... They list different part numbers online but it sure looks like it might be close enough to work. He doesnt care about originality otherwise Id just tell him to get the correct tank... he bought it in '69 and gave it the full 70's treatment; 6 tail lights, mudflap flares, shaved front bumpers, Ansen wheels, etc. I love it! 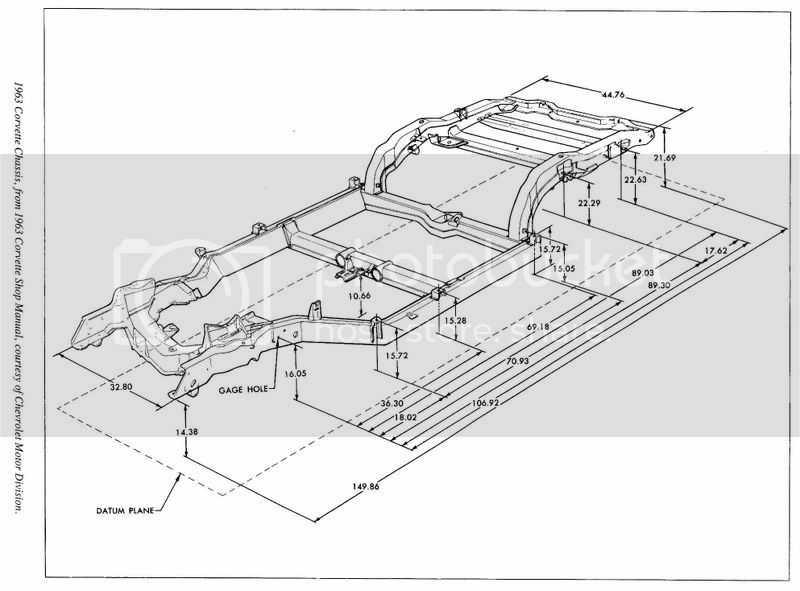 Here is a drawing of the frame for a 63-67. The back half were the tank mounts look different than my 68. 68-69 tanks have 1 fuel feed tube coming out of bottom of the sender gauge & can have a vent tube on the right side for vapor return depending upon HP. Crimp vent flat & solder slip closed. Both tanks have the same diameter for the sender hole & locking mechanism so a 63-67 sender will fit & mount in the hole. But 68-up senders are wired differently & cannot be used in a 63-67. About that 36 gal tank. Will it fit in a 69? And will the 69 sending unit fit the 67 tank (36 gal. )?